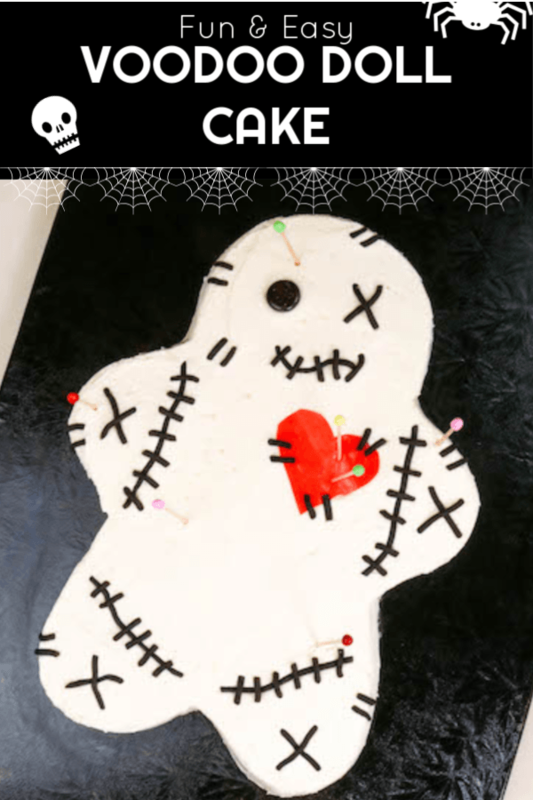 I think the voodoo doll cake video at the bottom of this post might be my favorite one yet. First, you’re like, “Wtf? Wrong holiday!” Then, you’re all like, “OMG! Never mind!” It’s an emotional roller coaster, I know. Hopefully this cake is coming at just the right time for you. Maybe there’s someone in your life that’s been irking you? Maybe you need to get a little aggression out and also bring dessert to the school Halloween party? This cake covers you on so many levels. I’m also going to go ahead and classify this as an #easyassheetcake. No carving, no piping, and the pan does most of the work. I’d say it qualifies! My supply list contains some affiliate links, because that’s how people on the internet make money. We live in the future! Position a rack in the center of the oven and heat the oven to 350 degrees F. Spray and flour the sides and bottom of the gingerbread man pan. Pour the batter into the prepared pan. Bake, rotating the pan’s position halfway through baking, until a toothpick inserted in the center comes out clean or with a few crumbs clinging to it, about 25-30 minutes. Bake times may vary depending on your oven. Always check for doneness first. Transfer the cake to a rack to cool in the pan for about 30 minutes. Turn the cake out onto a cake board or platter. Let the cakes cool complete before frosting, filling, or storing. You can make the cake up to a day in advance and store it wrapped at room temperature or in the fridge. When the cake has cooled, coat the cake with a layer of buttercream thick enough so that none of the darker cake underneath shows through. I find that using a piping bag fitted with a large icer tip helps this process when icing an odd shaped cake. Smooth the piped frosting with an offset icing spatula. Unroll the red fruit roll-up. If your fruit roll-up has markings or tongue tattoos, wipe them away with a damp paper towel. Leave the plastic on and flip the roll-up over. Draw a heart on the plastic and cut the heart out with a pair of kitchen scissors. Peel the plastic off the heart and place it on the cake. Add the longer pieces to the cake first and layer on the stitches. Trim the top off the black licorice drop. Discard or devour the top. Flip the bottom over use a toothpick to poke 4 button holes. Pop the eyeball on the cake. Cut the ends off the rainbow candy pieces. Discard or devour the middles and stick the rounded ends onto toothpicks. Playfully add the toothpicks to the cake or add them in a very deliberate way with someone special in mind. Muahahahaha!